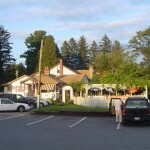 This now-closed inn was originally opened by Quakers in 1901 and remained in business until 1990. Its haunted status merited it a place on the MTV show “Fear.” Witnesses say that a woman committed suicide in room 62 just before her wedding, and her ghost has been seen. The men’s restroom in the basement is also said to be haunted. Reports say the building was damaged by arson in 2003 and is currently up for sale. Would love to have my group come and do an investigation! I worked there during my collge summer break in 1970. Examined every nook and cranny, never saw a ghost. I went here with friends the last time it was open for Halloween in 2002. it was so creepy!! We had someone walk past us in a hallway. they didn’t say anything…just walked past. we’re still trying to figure out if it wa a real person or a ghost. I was also there in 2002, the place is creepy but I didn’t experience anything unusual. In December 2016, I went on a double date to this giant haunted resort. They were actually mid-knocking it down when we visited. I didn’t believe in ghosts until I visited this resort. The second I stepped foot in the building, I went to go take a video. I viewed the video once, seeing orbs flying everywhere and weird foggy faces. I went to show my boyfriend the video, and my phone magically died when it was fully charged. It did not turn back on until we left the building. The rumors were that the 3rd floor is the most haunted, and the second we stepped foot on that floor, the temperature felt like it dropped by at least 20°. We heard a door slam multiple times on that floor, and you felt presence. Me and my group remembered where we came in by remembering doors, halls, certain graffiti, etc. We could not find our way out for a long time, it was as if it we were walking in circles in the basement. I saw a shadow, and heard whispering voices down there. It’s a shame they knocked this piece of art down. Should have made money bringing people in for haunted tours. Wish I could go back.